The hypothalamus is the part of your brain that controls body temperature, hunger and thirst. When you experience heat exhaustion, your body is producing more heat than it can release, especially if you are dehydrated, because your body reduces your body temperature mainly through sweat, according to the University of Maryland Medical Center, or UMMC. When left untreated, heat exhaustion can lead to heatstroke, which is when your body reaches temperatures of 104 degrees or higher, when you run the risk of organ failure, brain damage and death, according to FamilyDoctor.org. Eat foods that will support the proper functioning of your hypothalamus, which is part of your endocrine system. Such foods include seaweeds, leafy greens, carrots and seafood, including salmon and tuna, which contain essential fatty acids. You can also include olive oil, nuts such as almonds, cashews and peanuts as well as foods high in minerals such as broccoli, kale and collards. Eat fruits and vegetables that have a high water content, especially if you anticipate spending continuous hours working or playing in direct sunlight. Some of these foods include pineapple, cucumbers, apples, pears, tomatoes and oranges. 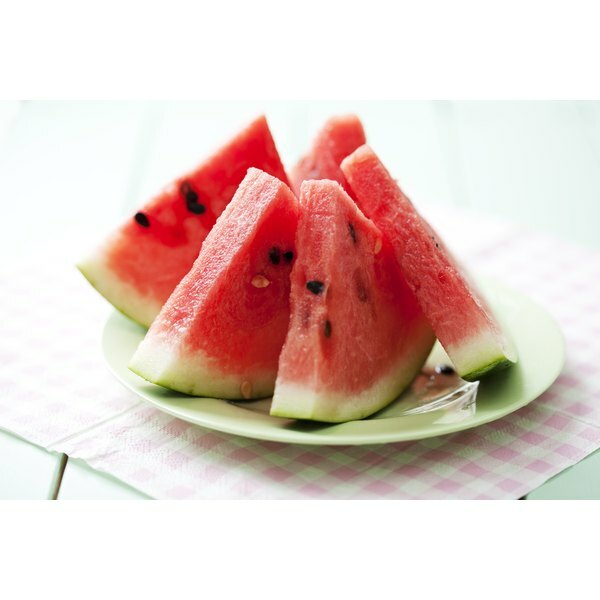 Watermelon is especially beneficial in hydrating your body, and you can eat it in chunks, add it to fruit salads or make watermelon water with it by putting it in the blender. Hydrate your body by consuming broths, soups and cereals with low fat or nut milk. Although food has its own water content, it is good to increase your liquid consumption with these types of food preparations. Miso soup is a good idea on cold days, and gazpacho, which is a Spanish cold soup, can be taken on hot days to refresh your body and keep you hydrated and nourished. Drink at least six glasses of plain filtered water per day to keep your body hydrated and always drink water when you are thirsty, as being thirsty is a sign of slight dehydration. Avoid consuming food that contains caffeine, such as chocolate, because caffeine will act as a diuretic, prompting your body to urinate, which will make you lose valuable fluids.